Q. Where can I find articles on the Trans Pacific Partnership (TPP) agreement? 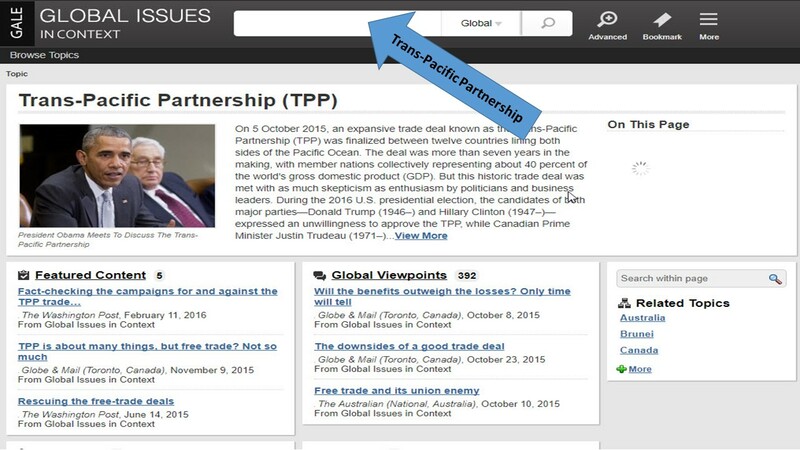 You can use library databases to find articles on the Trans Pacific Partnership Agreement (TPP). To access the databases referenced below, use the alphabet to find each database by its first letter. For Global Issues in Context , click on G and scroll down to find Global Issues. 3. To find additional articles you can use the ABI/INFORM database. Once you have accessed it from the A-Z list of databases page, the next step will be to generate keywords. Start with the basic acronym "TPP" or use the full name of the agreement as the keywords. Enter these into the ABI/INFORM search box. Note: remember to check on the small 'Full-Text' box before hitting the 'search' button. More specific keywords are used to narrow down the search to a specific aspect of your topic. For example, you could use "TPP" with the name of a specific country within the Trans Pacific (example: "TPP and Indonesia") or with an issue like job loss (TPP and "job loss"). Once you've chosen an article to include in your paper, ABI/INFORM has a 'Cite' feature that will enable you to create a citation for the article in APA or MLA format (depending on what was designated by the instructor). You'll see the 'cite' feature in the box at the top right (see image below). 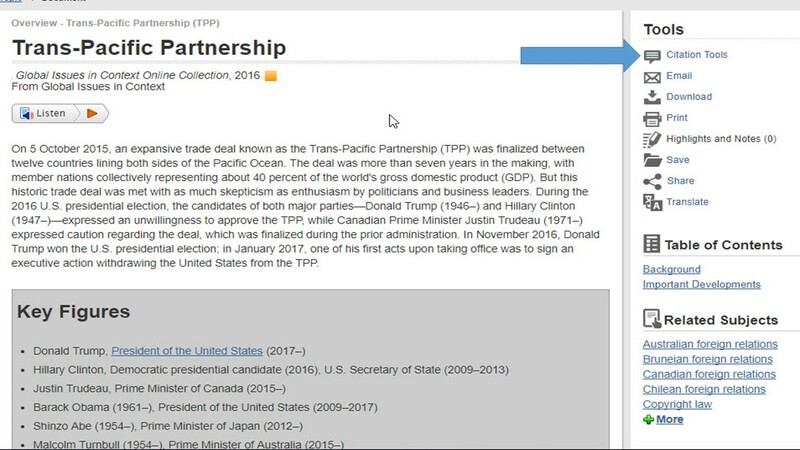 ABI/INFORM (ProQuest) and ProQuest Central - Use the search box for keywords (example: "TPP" or "Trans Pacific Partnership") to generate an initial results list articles, then use the 'Narrow Results' search options for a shorter list to review. Global Issues In Context - Click the "Business and Economy" view all link to view articles related to trade agreements. 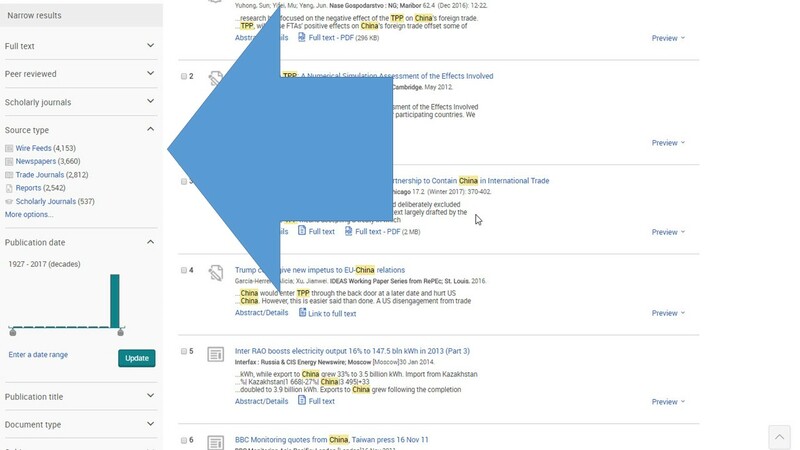 CQ Researcher - Use the "Browse Topics" tab to find and access the link for "International Trade" to view articles related to trade agreements. Business Insight: Global - Choose "Articles" in the drop-down menu next to the search bar. 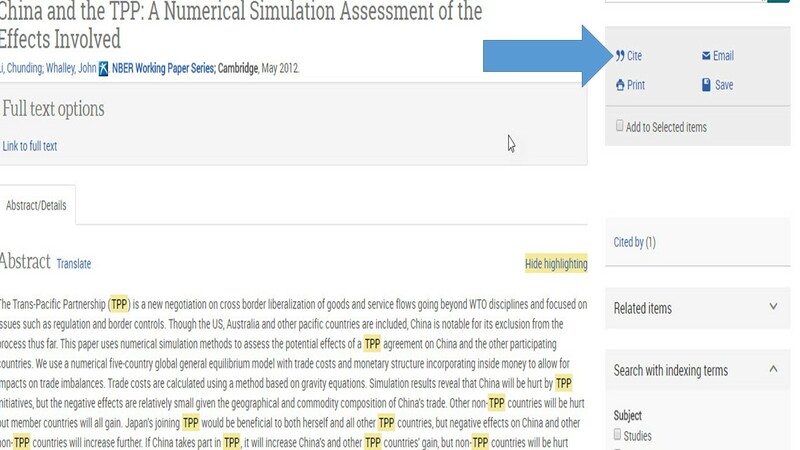 Use the keywords "trade agreements" to get an initial results list of articles, and then use the databases filter options on the left sidebar to limit the results by publication, publication date, and subject. If you are unsure how to access the library databases, watch the video below the links (Media).